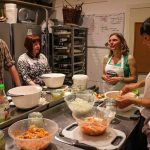 Whoever said the process of fermenting wasn’t fun clearly has never participated in one of Ruth Munro’s fermented foods workshops. Ruth is the owner of Edinburgh Fermentarium, which is an amazing company based out of Edinburgh. They sell everything from Kraut, Slaw, and Kvass. 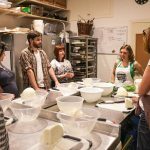 Edinburgh Fermentarium’s products are made with Ruth’s love for the health benefits that fermented foods provide us as humans. 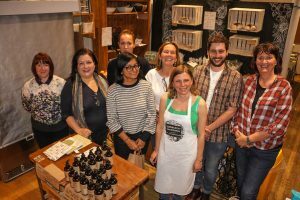 We welcomed Ruth into our cozy space at Larder Go on September 15th, for one of her exciting workshops. The first group arrived and we were all set up to make some green tea kombucha. Kombucha is an ancient fermented tea drink that has been consumed for thousands of years. It is made with a SCOBY (symbiotic colony of bacteria and yeast), which feeds on the sweetened tea. Kombucha has been said to improve digestion and gut health, mental clarity, mood stability, and help to balance out the body in general. 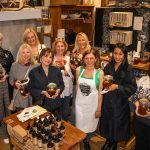 With their SCOBY’s at the ready, the first group began to make their very own jar of green tea kombucha. 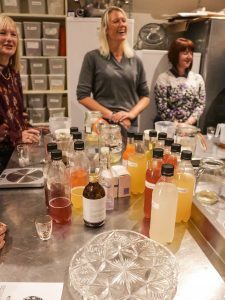 While doing so, they had the pleasure of tasting some of Ruth’s delicious and quirky kombucha flavour combinations that she brought along with her. Some of the flavours included Plum & Ginger, Date Syrup & Salt, and Chilli & Lime Leaf. During Ruth’s time with the first group, she educated on the amazing health benefits of kombucha and fermented foods. 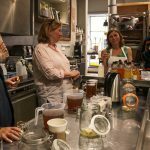 Ruth also educated on other uses for the SCOBY used to make kombucha. Some of the most interesting uses were that you can add a piece of your SCOBY to a smoothie or other blended foods for added nutrition, substitute it for Raw Fish in Sushi for vegetarian/vegan options, create a homemade SCOBY face mask, and even use pieces of the SCOBY as live bandages! After the first group left with their very own jars of green tea kombucha, we began to set up for Ruth’s next workshop. 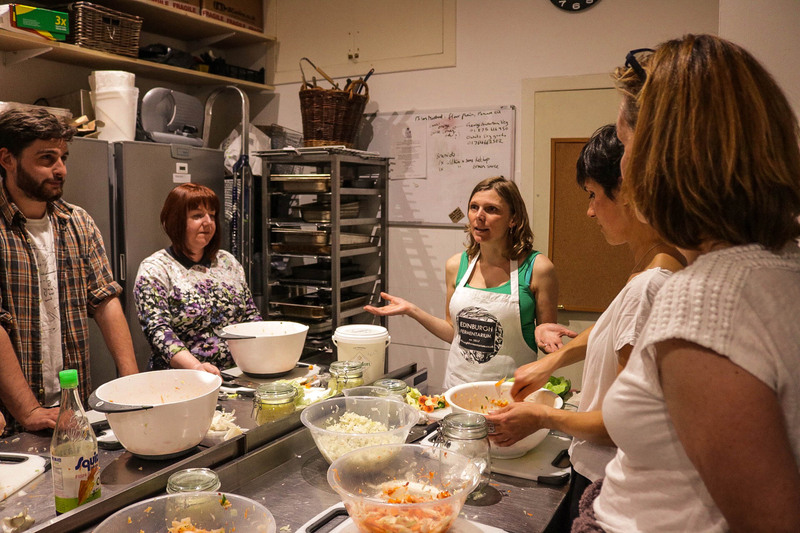 This would involve each attendee making their own jar of both sauerkraut and kimchi. After everyone had arrived, we escorted them to the kitchen where they were eager to get chopping. First, Ruth began with the sauerkraut, where the group massaged the cabbage with salt and spices such as caraway, fennel, and black pepper (or any other herbs of interest). 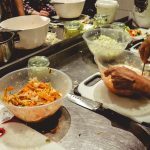 The same process went for the making of kimchi, but added vegetable such as carrots, daikon, spring onions, garlic, and chilli pepper to the mix for a more flavourful and spicy taste. Let’s just say the attendees now have forearms of steel from all of that massaging! Finally, the group was instructed to let their jarred up fermented foods sit for about a month, and to ensure that they “burped” their ferments at least twice a day in order to release any built up gas inside of the jars. 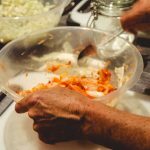 Like kombucha, kimchi, and kraut are filled with beneficial live bacteria and yeasts, known as probiotics, which are associated with better gut health and improved digestion. In the case of sauerkraut and kimchi, the bacteria already present on the surface of the cabbage leaves will ferment the natural sugars in the vegetables, creating the delicious final product. Kimchi & Kraut group happy after a session of learning how to ferment foods! Thank you so much to Ruth Munro for coming in and sharing her knowledge on fermented foods. The passion that Ruth has for these traditional foods and their benefits is unmatched. If you’re able to attend a workshop with her or get a hold of her products, you’re in for a great treat. If you’re interested in attending any of our future events with Edinburgh Food Social, stay updated on our Eventbrite and Facebook pages.